During many years JSC SVAROG successfully uses ultrasound vibrations to intensify the process of potable water and sewage disinfection by ultraviolet irradiation. This approach turns out to be still more urgent taking into consideration a growth in the stability of bacteria and viruses to the action of ultraviolet because a direct increase in the irradiation power does not result in achievement of the desired inactivation levels. Under such conditions, the involvement of auxiliary effective energetic factors is required that may provide necessary results at relatively small cost prices of their realization. Ultrasound is just one of such factors. In the application of ultraviolet (UV) water disinfection, a significant restriction is associated with the effects of biofouling and deposition of salt crystals on the surfaces of protective quartz-glass sleeves of UV lamps. This circumstance causes interruptions in the operation of disinfecting units and makes it necessary the use of special technical equipment to clean these sleeves by means of chemical and physical methods. The introduction of elastic vibrations of sufficient power with an ultrasonic frequency into an operative zone allows one to achieve such disinfection level which cannot be provided otherwise only through the use only of radiant energy. With that, the attainment of the desired inactivation levels may be provided at lower total power levels that ensures small cost prices of disinfection with stable results. Water is subjected to the combined ultrasonic action which causes the fragmentation of bacterial clusters into smaller units, the destruction of microorganisms, and the transformation of organic phases. With that, the continuous virucidal action of ultraviolet irradiation takes place which leads to a loss of the ability of microorganisms for reproduction. These processes occur simultaneously in one and the same chamber. Hence, ultrasonic vibrations which extremely well propagate through aqueous media, force all surfaces of inner reactor walls and protective sleeves of ultraviolet lamps to vibrate. This effect prevents the biofouling and salt deposition on the above indicated surfaces . Thus, simultaneously a number of processes occur which maintain a constant level of the inactivation during whole a service lies of UV lamps and ultrasonic transducers. This circumstance makes it possible to rise the effectiveness of water treatment under the commensurable power of UV irradiation by up to 103 times (see Fig. 1) and to destroy virtually completely (the complete photochemical oxidation) all forms (including spore forms) of microorganisms, viruses, and protozoa in the concentrations of up to 106 unit/l [2—5]. 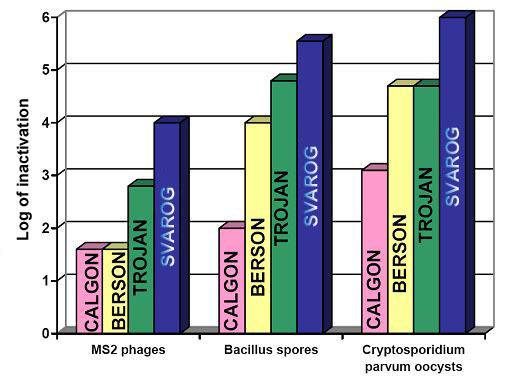 The conventional UV irradiation (in real time mode) as well as the ozonization is unable to suppress these types of microflora. The effect of complete inactivation in conventional technologies of UV irradiation and ozonization is achieved at very low concentrations of spores and protozoa under prolonged actions and virtually is unable to destroy molds. The use of combined “Ultraviolet + Ultrasound“ technology in water disinfection allows one to significantly reduce the application of chemical disinfection reagents. For example, when this technology is used in swimming pools, the effect of algal blooms may be easily excluded, and the chlorine concentration may be appreciably reduced. In fact, the application of UV + US technology in swimming pools with hard water in Great Britain (in Liverpool and Manchester city) made it possible to reduce a level of chlorine concentration from (3.6 – 3.4 mg/l) (for previously used conventional disinfection technology) down to approximately 0.05 – 0.1 mg/l. Moreover, the consumption of flocculants and coagulants was also significantly decreased (by 2 – 3 times). With that, a high quality of is ensured and the smell and taste of chlorine are not felt. The side products being formed in the course of disinfection due to chemical reactions between disinfecting reagents and molecules of organic substances, which occur in water under treatment, may cause either the appearance of unpleasant water taste and smell or the formation of toxic or carcinogenic substances in water. Therefore, the “Ultraviolet + Ultrasound“ technology, realized in the units of “Lazur-M” series, is successfully employed for the disinfection of potable water and sewage both in the systems of individual use and for industrial-scale applications. 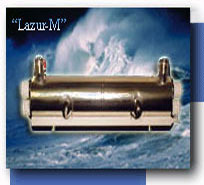 The performance of “Lazur-M” units with respect to its disinfecting characteristics was thoroughly investigated over several years (1998 – 2003) at facilities of the Rand Water Board Company (the Republic of South Africa), one of the largest water treatment technology centers in the world . 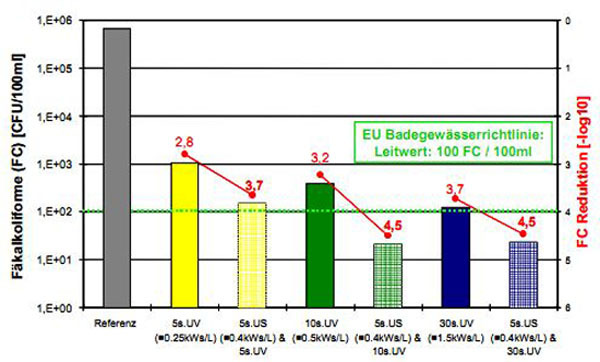 According to the conclusions of specialists of this company, the use of proposed “Lazur” disinfection technology (under the condition of industrial scale of unit capacities) provides much greater effectiveness (by a factor from 100 to 1000) with significantly lower relative economic expenditures (by 2 – 3 times per 1 m3 water; see Table 1 and Fig. 2). * This is the strongest known kind of molds. The molds of this type could be effectively destroyed neither by ultraviolet irradiation nor by the ozonization. 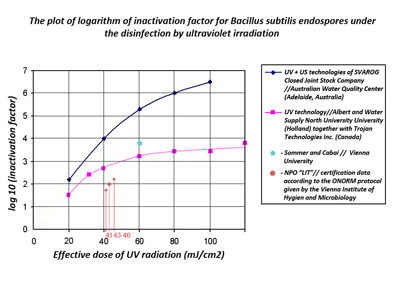 The doses of UV irradiation generally used in Russia in accordance with the actual regulations (16 – 25 mJ/cm2 for potable water disinfection and 30 mJ/cm2 for economic and domestic waste water treatment ) are insufficient to provide the effective inactivation of all kinds of pathogenic microflora. Moreover, it is necessary to take into consideration a recently observed rise in the resistance of microflora to the action of chlorine, ozone, and ultraviolet radiation. This phenomenon is the natural process of evolution. Microbiologists of the leading scientific centers of America, Asia, and Europe earnestly demonstrate in their reports that, over the last 15 – 20 years, the resistance of pathogenic microflora to the action of chlorine, ozone, and ultraviolet has increased by 5, 2 – 3, and 4 times, respectively . This fact implies that, with due account for the expected further growth of resistance of microorganisms, spores, viruses, and protozoa to the above mentioned means of water and sewage disinfection, it is necessary to establish for projectible water treatment stations the higher guideline levels of disinfecting factors. These guideline parameters must take into account the dynamics of resistibility for the objects of disinfection. That is why now in the economically developed countries the minimal dose of UV irradiation is established to be as high as 40 mJ/cm2, whereas for all projectible stations of water and sewage treatment this parameter is set to be 70 – 100 mJ/cm2. Certain positive tendencies with regard to the guidelines for an increase in the recommended doses of UV irradiation have appeared in the Russian Federation over the last few years . However, the steps in this direction are too timid. Many manufacturers of equipment do not hasten to take into consideration the growing requirements because of the necessity to increase production costs. The data of T. Blume and G. Neiss, who performed important investigations “Sterilization of Waste Water by the Ultrasound in Combination with Conventional Disinfection Processes” (2000 – 2004) at the Hamburg-Harburg Technical University (Germany) , confirm that the combination of the processes “Ultrasound + Ultraviolet” is actually effective, and, moreover, energetically more preferable than the treatment solely by UV irradiation (Fig. 3). Even after 30 s of solely ultraviolet irradiation, the required level of disinfection indicated in the acting regulations was not achieved. The statement that the mechanical action of ultrasonic vibrations causes an increase in the total number of microorganisms in water under treatment is one of the myths about the hazards of ultrasound. In actual fact, the quantity of microorganisms is not changed, but the thorough stirring according to the relevant analysis technique affects this quantity in the intake water. Methodical guidelines  directly note this effect: “2.11. … After mechanical cleaning, the occurrence of virus elution may insignificantly grow due to the disintegration of coarse conglomerates and readsorption of viruses”. High technical and operational characteristics of the produced equipment provide the demand of industry for the “Lazur” technology and the up-to-date level of UV technological development. On the whole, this circumstance indicates that there are all conditions for the large-scale application of ultraviolet radiation in various areas of municipal economy and for the solution of the problems of large cities and industrial enterprises. • One of such enterprises – the German “Grundbeck Wasseraubereitung” Company - still 11 years ago offered the “GRUNBECK GENO Break System IV” setup based on the use of combination of ultrasonic and ultraviolet units. This system is able to destroy legionella bacteria as well as their bridging species – amoebae. As it is known, the company manufactures several modification of the said system. • Over the last few years, the international “Atlantium” consortium performs the intense development based on the use of combined UV + US water treatment. As a result, the units of RZ 104 series have been created and successfully applied. The use of ultrasound makes it possible to achieve the required dose of up to 120 mJ/cm2 with respect to ultraviolet. The company names this method as “hydro-optical disinfection of water”. The setups of “Atlantium” are already applied in Russian industry, for example, at soft-drink bottling factories of “The Pepsi Bottling Group” and “Coca-Cola” corporations and from 2008 at Moscow “Ochakovo” brewing and soft-drink factory . Over the period of more than 10 years, the team of Russian researchers representing various scientific directions performed the investigations of the effectiveness of destructive action of ultraviolet and of the ultraviolet + ultrasound combination on helminth oocytes and cysts of pathogenic intestinal protozoa which occur in aqueous media. These investigations allowed one to draw the sanitary-parasitolological evaluation of these disinfection methods . 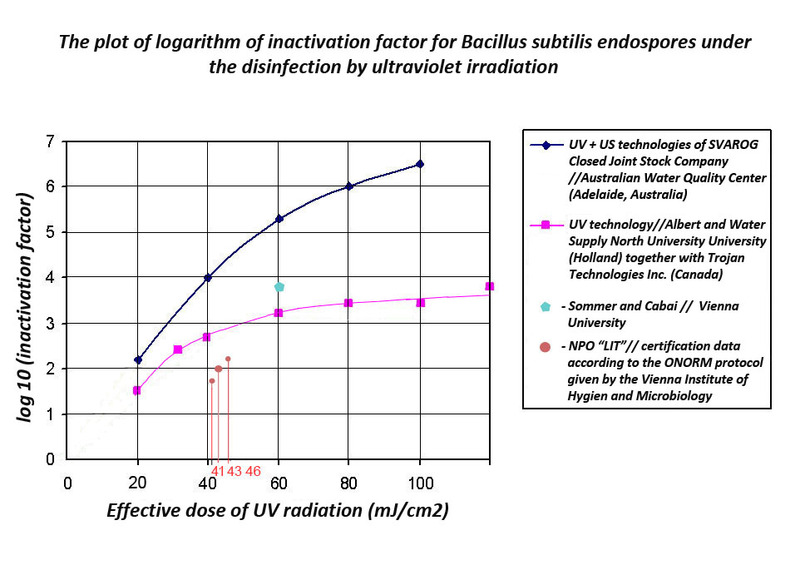 It was found that the optimal inactivation doses of UV irradiation, when industrial UV setups are used, comprise 35 – 40 mJ/cm2 for protozoa pathogens and 65 mJ/cm2 for helminth oocytes (first of all, for Ascaris oocytes, as the most resistant organisms). The experimental studies of the technology of simultaneous action of ultraviolet irradiation, ultrasound, and acoustic vibrations on the estimation of the germicide effect with the use of biological testing under various hydrodynamic operative regimes of the setup (ultraviolet, over 40 mJ/cm2, and ultrasound, over 2 W/cm2) showed that the complete germicide effect is realized for all hydrodynamic regimes. It was noted, that the complete germicide effect is achieved only in the case of combinative action (UV + US). Due to the circumstance that ultrasound is an excellent disperser, the introduction of an oxidant (hydrogen peroxide) even in small amounts (1.5 – 5.0 mg/l) into the model liquid containing parasitogenic pathogens enhances the germicide effect of the combinative action of ultrasound and ultraviolet. This phenomenon allows one to increase twice the nominal water flow rate and, thus, to significantly reduce economic expenditures in the application of the said technology for the purification of water from causative agents of intestinal parasitogenic illnesses. • indication of the operative modes of setups, signal informing about the soilng of quartz-glass sleeves, data from a time meter, and signals of emergency situations are transmitted to a system control panel. Special attention in the development of setups is paid to the convenience and simplicity of maintenance works. 1. 1. Ultrasound: Encyclopedia. Ed. by I.P. Galyamina. Moscow, 1979. 2. A.N. Ul'yanov, “Application of Ultraviolet Radiation in Combination with Other Physical Processes for Water Treatment in Small Settlements”, Vodoochistka. Vodopodgovka. Vodosnabzheniye. (Water Purification. Water Treatment. Water Supply), 2004, no. 1, pp. 13 – 16, and 2007, no. 4, pp. 6 – 9. 3. A.N. Ul'yanov, “Full-scale Testing of the Ultraviolet Disinfecting Setup on the Place of Its Operation”, Vodoochistka. Vodopodgovka. Vodosnabzheniye. (Water Purification. Water Treatment. Water Supply), 2005, no. 2, pp. 22 – 26. 4. A.N. Ul'yanov, “Ultraviolet Radiation in Disinfection of Potable Water” Vodosnabzheniye i Kanalizatsiya (Water Supply and Sewerage), 2003, no. 4, pp. 16 – 18. 7. Proceedings of the 2 nd International Congress on Ultraviolet Technologies (2003), 9-11 July, Vienna, Austria, and of the Third International Congress on Ultraviolet Technologies, IUVA, Telus Whistler Conference Centre, Whistler, BC, Canada; IOA/IUVA World Congress on Ozone and Ultraviolet Technologies. (2007), August 27-29, Hyatt Regency Century Plaza, Los Angeles, CA USA. 8. MU 3.2.1757-03 “Preventive Measures Against the Parasitogenic Diseases. Sanitary and Epidemiological Evaluation of the Effectiveness of Water Disinfection by Ultraviolet Irradiation. Methodical Guidelines.” (the Russian Federation). 9. Torben Blume and Uwe Neis, “Sterilization of Waste Water by the Ultrasound in Combination with Conventional Disinfection Processes” (“Entkeimung von Abwasser mit Ultraschall in Kombination mit herkommlichen Desinfektionsverfahren”), 2000 – 2004, Hamburg-Harburg Technical University (Technische Universitat Hamburg-Harburg), Germany, http://www.tu-harburg.de/aww/forschung/pdf/beschreibung_tuhh01.pdf. 10. MUK 4.3.2030-05 “Sanitary- Virusological Control of the Effectiveness of Potable Water and Sewage by UV Irradiation” (Methodical Guidelines, the Russian Federation). 12. G.I. Novosil’tsev et al., “Evaluation of Germicide Action of the Up-to-date Methods of Water Disinfection from Pathogenic Organisms of Intestinal Parasitogenic Illnesses” (the report in Proceedings of theAquatech-2008 International Water Forum, Moscow, 2008).